Sign up for free and just shop with Ray-Ban as normal. Our average member earns over £300 cashback a year. Cashback will not be paid when a discount code is used. Ray-Ban cashback can be earned simply by clicking through to the merchant and shopping as normal. Ray-Ban Cashback is available through TopCashback on genuine, tracked transactions completed immediately and wholly online. Ray-Ban are a global leader when it comes to premium eyewear, with their collection featuring a wide range of unique, iconic and personalised sunglasses and prescription glasses for men, women and kids. Whether you are looking for timeless and original Wayfarer styles, sunglasses which will match your style, special editions or online exclusive items, or you are thinking of buying something from the Ray-Ban Aviator collection, you will not be disappointed. Discover women's fashion glasses which will match your lifestyle, a pair of Ray-Bans with sporty frames if you like to keep active in yours and stylish sunglasses at Ray-Ban. You can also customise your Ray-Bans with Ray-Ban Remix, which offers custom styles and unique engraving. Sign up using your email and you will receive exclusive Ray-Ban offers on glasses and sunglasses, while they give you the chance to receive exclusive perks if you sign up to The Ones Club. They will send glasses direct to your door via free delivery, while you can also take advantage of free returns and a student discount. Check out Ray-Ban sale events if you are looking for glasses at an even more affordable price, while if you sign up to TopCashback today, you can save on Ray-Bans prescription glasses and more with our superb cashback deals. You should also keep your eyes peeled for any Ray-Ban discount codes, which will allow you to make double savings. If you are in need of some new shades, you will find plenty of choice on the Ray-Ban UK website. Opt for prescription sunglasses if you want to take care of your eye health while out in the sun, while you can search for solutions which have Flash, Evolve or polarised lenses. You can also take a look at their limited edition Scuderia Ferrari collection. Whether you are searching for Aviator sunglasses or Wayfarer sunglasses, they have various different styles of children's, women's and men's sunglasses, including pairs with gold and silver rims. If you are looking for a new pair for your holiday, don't forget to see if there are any Ray-Ban offers available or Ray-Ban sale events, which could save you money. One of the best ways to get yourself a Ray-Ban discount is to shop through one of our cashback offers and get money back when you pick up a new pair of sunglasses.
. Don’t forget that when you order direct with Ray-ban you’ve got no worry of wasting money on counterfeits, plus you can also enjoy free shipping and free returns. Ray-Ban sell designer eyeglasses for men, women and kids, offering styles such as full rim, rimless and semi-rim in both plastic and metal. Their iconic eyeglasses are a declaration of belonging, style and attitude, and they have the right kind of glasses for everyone. View new arrivals or best sellers for the latest and most popular looks, including the New Wayfarer, the Timeless and the Erika, while you can also take a look at hot trends such as hexagonal and oval optics. Once you have chosen your glasses, you can shop Ray-Ban accessories such as special edition cases, clip-ons and cleaning kits. Whatever style of optical wear you are thinking of buying, don't forget to check out our cashback deals and see if we have any Ray-Ban discount codes. You can stand out from the crowd and create your very own pair of Ray-Bans thanks to their customisation service. Choose your frame, colours, lenses and case style, while you can even have your glasses and sunglasses engraved if you want your design to be truly original. 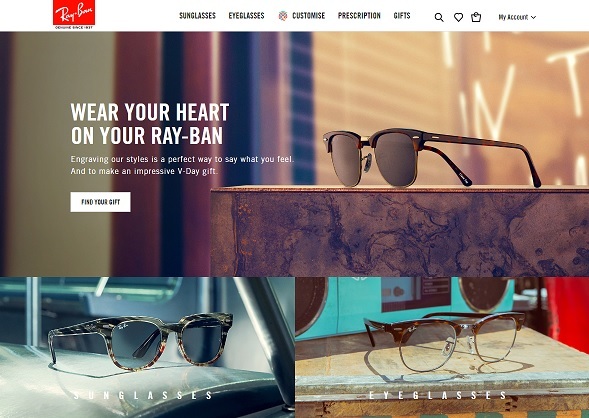 The Ray-Ban Remix service is exclusively available on Ray-Ban.com and allows you to customise your favourite style. Choose from an extensive range of shapes, which includes Clubmaster Classic, Round Double Bridge and Justin Classic, at Ray-Ban UK. Once you have found the ideal type of glasses for your face or style, you can then get to work on the fine detail. Customise the frame colour and material, then pick your lenses, whether you want polarised, mirror or gradient. Choose the colour of the temples and temple tips, then add a personal engraving if you want. They will follow your design, right down to the customised case, and will deliver them for free within four business days and in a special package. You can see clearly with authentic prescription lenses which are available for your Ray-Ban frames. Available in single vision or multifocal, they offer DTS technology, the Ray-Ban signature and UV protection. Not only will you enjoy the vision you need and the most iconic shapes, but each pair is built entirely by Ray-Ban — tailor-made to your exact prescription and crafted to your signature frame. Prescription lenses are available in both eyeglasses and sunglasses, and they are easy to order. Choose your frame style and lens, check out, then submit your prescription by email, fax or by uploading it. Your eyewear will then be shipped to your door. The digital technology with built-in protection will help keep your eyes safe. They offer high definition vision and UV protection, plus a blue light filter, while each lens is cut to fit its frame perfectly. With eyeglasses, you can choose the exact frame you want, down to the colour and size, so they will fit in with your signature style, while you can add prescription lenses to Ray-Ban sunglasses. Ray-Ban have been a leader in sun and prescription eyewear for generations, having been created in 1937 by American company Bausch & Lomb, who were based in Rochester, New York. In 1929, US Army Air Corps colonel John A. Macready worked with the medical equipment manufacturer to create aviation sunglasses which reduced the distraction for pilots caused by the intense blue and white hues of the sky. Specifically, Macready was concerned about how pilots' goggles would fog up, greatly reducing visibility at high altitude. The prototype, created in 1936 and known as Anti-Glare, had plastic frames and green lenses which could cut out the glare without obscuring vision. They added impact-resistant lenses in 1938, while they were redesigned with a metal frame the following year and patented as the Ray-Ban Aviator. Since the introduction of the iconic Aviator model, they have been at the forefront of cultural change and have become a symbol of self-expression, with their glasses worn by public figures and celebrities around the world. During the 1950s, Ray-Ban released the Echelon (Caravan), which had a squarer frame, while the Olympian I and II were introduced in 1965. These became popular when Peter Fonda wore them in the 1969 film Easy Rider. They have also produced special edition lines, including The General in 1987. These were similar to the original Aviators worn by general Douglas MacArthur during the Second World War. Throughout the years, their core values have included timeless style, authenticity and freedom of expression. In 1999, Bausch & Lomb sold the brand to the Italian eyewear conglomerate Luxottica Group.